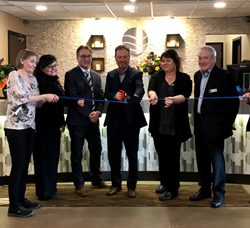 The Medicine Hat Comfort Inn and Suites showed off its extensive renovations at its March 6 re-launch party, which was attended by special guests and included tours, refreshments, contests, door prizes and more. From left, Monica Kallis, Irlanda Price, local MLA Drew Barnes, Medicine Hat Mayor Ted Clugston, Carrie Bruce, Lloyd Daser. The event included a ribbon cutting, using a saw in place of scissors to represent the renovations, as well as refreshments, room tours, and a live broadcast by Steve Krysak, from local radio station CJCY. Members of the public, invited dignitaries, and special guests rubbed elbows as the Medicine Hat Comfort Inn and Suites showed off its recent renovations at its re-launch party on March 6. “We had over 100 people attend the event, and we received many positive comments on how beautiful the hotel looks and feels. One couple, who attended the hotel’s original grand opening more than 20 years ago, was really impressed with the changes that have been made,” said Carrie Bruce, general manager of the Medicine Hat Comfort Inn and Suites. The event included a ribbon cutting, using a saw in place of scissors to represent the renovations, as well as refreshments, room tours, and a live broadcast by Steve Krysak, from local radio station CJCY. Those who brought an overnight bag were entered into a contest to win a free night’s stay in the hotel’s spacious, loft-style Honeymoon Suite, with hourly draws for a free night’s stay in the King Jacuzzi Suites. A display from the Habitat for Humanity’s Medicine Hat ReStore informed visitors of the Comfort Inn and Suites’ $11,757 material donation of old furniture and furnishings, with proceeds going to help families in need. “The money will be going towards the Habitat for Humanity duplex located behind Home Depot. We are happy to have a hand in helping local families access affordable housing,” says Bruce. Dignitaries in attendance included Medicine Hat mayor Ted Clugston and Drew Barnes, MLA for Cypress-Medicine Hat, as well as Irlanda Price and Chantel Fischer, Community Connections Chair and Membership Services Coordinator, respectively, with the Medicine Hat and District Chamber of Commerce. Also in attendance was Choice Hotels Canada representative Peter Sellick, Regional Sales Manager, Western Canada, and Lloyd Daser, Director of Operations at the Braemar Group, the development company that owns the Medicine Hat Comfort Inn and Suites as well as four other hotels in Western Canada. The Braemar Group will soon open its sixth hotel, the 110-room Marriott TownePlace Suites, also in Medicine Hat. Originally built in 1997, the three-story, 100-room medicine hat hotel includes 24 executive suites, five oversized Jacuzzi suites, and one two-level honeymoon suite. Located on the Trans Canada Highway adjacent to one of the largest shopping centres in southern Alberta, the hotel also offers pet-friendly and accessible rooms and features amenities such as an indoor pool, a fitness room, and meeting facilities which can accommodate up to 50 people.